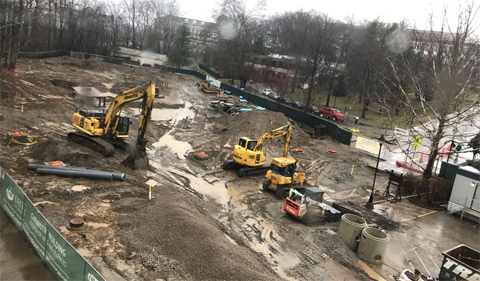 It is wet and muddy but much of the underground work (sanitary, water, gas) are done and work has begun on preparing the pad for the building. Scheduled activity for the new Chemistry building during the weeks of Feb. 4 and Feb. 11. Gas Line Phase 2 Installation – NOTE – Gas Outage was performed on Feb. 4 and Feb. 5. NOTE – Work will occur on South Green Drive, single lane shutdowns will occur and traffic patterns will be maintained via signage and Flaggers. NOTE – Work will occur on west side of Clippinger starting Thursday, Feb. 7, and will close that sidewalk for approximately one week. Continue building pad preparation involves moving and grading soil. 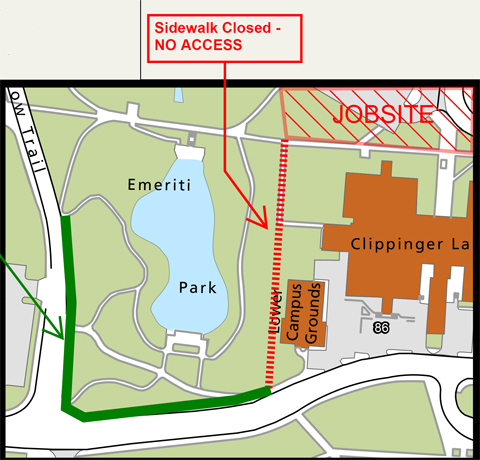 Waterline Installation – NOTE – Sidewalk west of Clippinger will be closed to allow for installation.